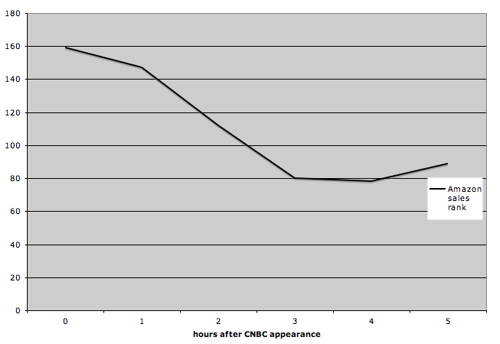 This chart shows Myth of the Rational Market‘s movement in the Amazon.com sales rankings after I made an appearance on CNBC this morning and my fellow guest Arthur Laffer, who had read the book over the weekend, got absolutely gushy about it. That’s what you call the power of Art. Myth is starting to become the subject of pretty frequent blogospheric discussion. Some of this is just because I made sure bloggers got copies. That explains this nice post by my former neighbor Phil Coggan, the capital markets editor at the Economist. And this one by Matthew Yglesias. My editor gave a copy to Baseline Scenario's James Kwak, which resulted in this. My PR czarina got a book to The Deal's Robert Teitelman, which led to this. To get the most attention, the essay should be wrong. … Yale professor Paul Kennedy had a distinguished but unglamorous career under his belt when he wrote The Rise and Fall of Great Powers, predicting American decline. He was wrong, and hundreds of other commentators rose to say so, thus making him famous and turning his book into a bestseller. Francis Fukuyuma wrote an essay called "The End of History," which seemed wrong to people who only read the title. Thousands of essayists wrotes pieces pointing out that history had not ended, and Fukuyama became a global sensation. I like to think my book falls in the Fukuyama category (the title is perhaps exaggerated, but the text holds up pretty well), not the Kennedy one. Although I'm not sure Kennedy was wrong. Early, perhaps. But not necessarily wrong. Brooks also recommends book titles that begin with The End of, or The Death of. I guess The Myth of is close enough. 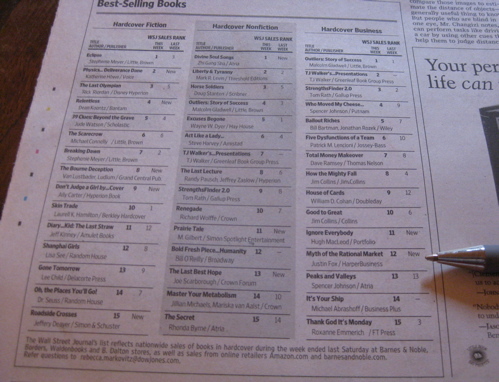 Myth made it onto the Wall Street Journal business best-seller list in its first week on the market. I can't find any online version of the list; hence this photo from the Friday (June 19) paper. The next big thing was checking online Saturday morning to see if it had made it onto the New York Times's extended best-seller list. No such luck. And the NYT business best-seller list only comes out once a month. Considering that I never expected for this book to make it onto any kind of best-seller list at all, this is pretty great. But of course it makes me want more, more, more. That was Morning Joe on Wednesday. I also did interviews this week with public radio’s Marketplace, CBC Radio’s As It Happens (my segment is about halfway through the recording) and Slate/The Big Money’s Every Day I Read the Book with Dan Gross. Amazon ran out of copies of Myth yesterday. My local Barnes & Noble doesn't have any left, either. Thousands more are on the way to Amazon and B&N, and HarperCollins is already going back for a second printing. Update: Amazon got it back in stock Monday afternoon (June 15). Justin Fox’s description of how the idea evolved and conquered is fascinating and entertainingly told. A statement of investor impotence—an attack on the bold ones (“idiots”, said Larry Summers, a distinguished economist) who think they can beat the market—soon became a near-religious belief. Nobel-laureate preachers, such as Milton Friedman and Merton Miller, proclaimed from the pulpits of the University of Chicago that the market could do no wrong. Mr Fox has written a worthy successor to “Capital Ideas”, the late Peter Bernstein’s 1990s classic on the emergence of the rational-market myth: bang up-to-date; alas, without the happy ending. The review withdrawal is still coming, of course. Soon. And it’s clearly going to be ugly. No. 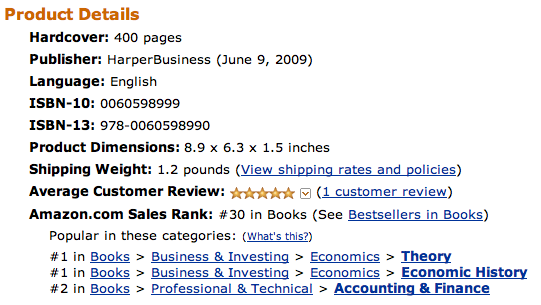 30 is as high as the book has gotten. It may be as high as it ever gets. It's certainly higher than I ever expected it to be. The reason it's #2 in Accounting & Finance and not #1 is that Peter Schiff, author of Crash Proof, was on the Daily Show last night. I wrote a column that probably played a role in getting Schiff that booking, so this is largely my fault. 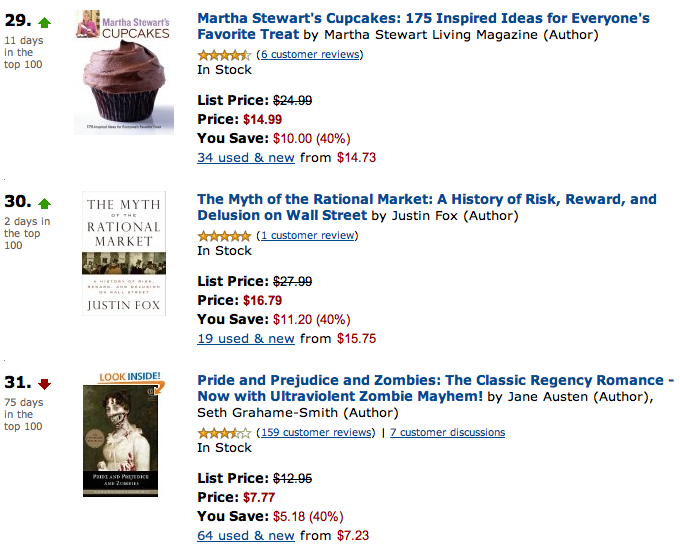 My real fixation, though, is with Martha Stewart's Cupcakes. I briefly overtook it last night, but can't seem to catch it now. What must I do??? practitioners, such as Jack Bogle, Michael Milken and Alan Greenspan. in his drama to life with an appealingly breezy style. Well, depends what you mean by "efficient." But I'm not complaining. Definitely not. 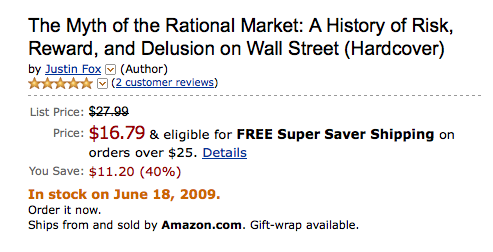 Valiant Defender of the Quants Eric Falkenstein has a very weird post about The Myth of the Rational Market. On Seeking Alpha it's even labeled a "book review," which is even weirder because Falkenstein gives no indication of having read the book. The table of contents, maybe—or I guess it's possible that he read the book but did so in such a state of dudgeon because of the blurb from Nassim Nicholas Taleb on the back cover (Falkenstein can't stand Taleb) that he was unable to digest any of the actual text. Okay, let's see: I never say in the book that efficient market theory implies that price changes are normally distributed. I do not attribute LTCM's failure to the Black-Scholes-Merton option model's assumptions. I guess I do push the idea in the book that in the 1960s through 1980s a lot of people at the universities of Chicago and Rochester believed that markets were close to perfect but, well, in the 1960s through 1980s a lot of people at the universities of Chicago and Rochester did believe markets were close to perfect. Straw men, eh? But it's not that disappointing. Controversy is good for book sales, and a repost of Falkenstein's screed on Henry Blodget's Clusterstock brought a whole pile of entertaining comments, most of them berating Falkenstein. What I would like best, though, is for Falkenstein to actually read the book— and then go on the debating circuit with me. idea, the efficient markets theory. and then credit contraction and asset deflation. Isn’t history meant to be written by the winners? It's an entirely valid point. And if Pressley is in fact wondering why I shunted Hyman Minsky to the epilogue, it's because I tried really hard to fit him earlier in the narrative and I just couldn't make it work. I imagine that if I been writing (as opposed to just tweaking) after September 2008, I would have tried much harder to fit Minsky in, but it was always going to be difficult because he simply wasn't part of the debate among finance scholars. He still isn't, I imagine—which tells you something about academic finance. Since I'd made the decision to write the book as a series of interlocking narratives, having somebody who wasn't interlocked with the rest of the narrative at all was always gonna be problematic. That said, there has to be some way I could have woven in Minsky and his popularizer Charlie Kindleberger, and Kindleberger's ongoing debate with rational-market true believer Peter Garber. I just never figured out what it was. But there are lots of paths-not-taken like that when you write a book. I'm still wondering if maybe I made a huge mistake in not giving MIT's Andrew Lo a big role in the narrative. I think this is what I'll discuss in all my TV and radio interviews—my failure to give Hyman Minsky and Andy Lo their due. That kind of stuff totally sells books, right?